Contradictory statements by Army Undersecretary Ryan McCarthy have left unclear just how many Joint Light Tactical Vehicles the service intends to buy. On March 11, Army officials told Congress — via the Defense Department’s spending proposal for fiscal 2020 — that they want to shrink next year’s purchase of the Humvee replacements from the planned 3,035 to 2,530, a 16 percent cut. Three days later, the undersecretary talked about the service’s plans to buy fewer of the Oshkosh-made vehicles. “There’s no doubt the Army needs it in the future — just not at the numbers of the original program of record when the requirements of a high-intensity land conflict are considered,” he said March 14 at the Brookings Institution. Because 49,099 minus roughly 1,900 does not equal 49,000, McCarthy’s statements have left Oshkosh executives and outside observers wondering just what’s going on. Oshkosh’s stock price dropped nearly 6 percent after March 11, though it has since regained about 1 percentage point. Wayne Hall, an Army spokesman, was unable to immediately say whether the overall JLTV project was being trimmed. Regardless of the final number of vehicles purchased, McCarthy and other senior Army officials said the service is planning to shift funds in the coming years to projects needed more urgently in a near-peer fight. The Army has plans to slow or kill 93 projects in coming years to fund higher-priority programs it says are needed to compete against Russia and China. But Mansfield argued the JLTV is well-suited for the near-peer threat. “We believe that the JLTV actually fits the strategy very well,” he said. “It’s not a Humvee that had a hard time coming out of the wire once the threat changed. We’re very [modular] so we can increase and decrease the protection level of this vehicle. “We believe we meet the strategy and as we show and introduce new weapons systems on the top of the truck or new mission system modules on the backside of the truck, we believe we have a vehicle that they need in the future for that near-peer threat,” he said. 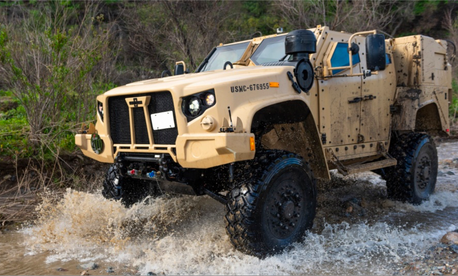 Congress will have the ultimate say in whether the annual JLTV buy shrinks, and Mansfield said the company is planning for the truck to enter full-rate production this summer. In the meantime, the company is working on new configurations for the truck, to include adding cannons and lasers and other electronics, Mansfield touting the truck’s modularity and ability to add levels of armor. “We’re always looking to put different weapons stations up on top,” he said. The JLTV was designed to make up for the performance Humvees lost when the military had to add armor to protect soldiers from IEDs and other roadside bombs in the wars in Iraq and Afghanistan. But now the Pentagon is envisioning decades of competition with Russia and China prompting a shift for the counterinsurgency battles that have dominated the past two decades. The Army chose Oshkosh as its JLTV maker in August 2015. Since then the company has received orders for more than 11,000 vehicles. The U.S. Marine Corps is also buying the vehicle.